There is such a wealth of information in the homeopathic materia medica that a concise but thorough, structured but adaptable summation is needed to assist the overawed student in studying and the busy practitioner in retaining the essentials. This is the aim of SYNOPTIC REFERENCE. 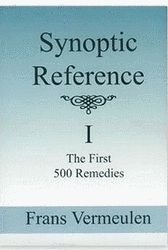 SYNOPTIC REFERENCE’s 500 remedies have been selected from over 6000 available remedies, ranging from the most traditional to the very new. Some are well-known with many uses and others are rare and little known. All are presented with a host of useful information. Moreover, some remedies do not appear in an appreciable way in any other materia medica. The remedies occur in the following divisions - 274 Plants, 132 Minerals, 64 Animals, 18 Nosodes, 10 Fungi and 2 Imponderables. This accurately reflects the proportion of various kingdoms and groupings in the entire homeopathic materia medica. The plant kingdom is by far the largest, followed by minerals and then animals. The extensive Source and Substance section includes the latest scientific names as well as kingdoms or groupings. Correlations between source and symptoms are in a “Prisma-like” fashion. Characteristic features are described that enable prescribing on and comparison with materia medica, clarifying and highlighting the importance of certain symptoms in the materia medica. From the earliest times in homeopathy, connections between symptoms and qualities of substances have been noted and incorporated in remedy pictures. This has reached refinement in “source-based prescribing,” which most fully acknowledges and utilizes such connections. At the philosophical core of these ideas is the obvious statement that nature is full of phenomena, as described by chemistry, metallurgy, botany, physics and biology. There are plenty of additional ways besides these sources in which all parts of nature are expressed and interact with man. Living proofs of these are fairytales, legends, myths, traditional medicinal uses, economic avail, industrial applications and other relationships between men and animals, plants or minerals. In fact, rather than a proving being just a fragment of life, it appears that all of life is a giant, on-going proving. When applicable, these sources are used to correlate with existing materia medica for a comprehensive understanding of a remedy. The Materia Medica is subdivided into 4 Sections, which are Mind, Generals, Sensations and Locals. The sections contain individualizing characteristics and key symptoms. Out of a preponderant amount of materia medica information, these listings help focus on significant symptoms. They are derived from both clinical and proving symptoms for a balanced approach. Repertory rubrics are up-to-date, being derived from the Synthesis Repertory in the Radar OPUS program. Additional information is obtained from a wide variety of international Materia Medicas. A completely new feature, the PLUS GROUP consists of several distinctive characteristics or symptoms that define the remedy. Generally, the most distinct quality is listed first. With each added symptom, the possibility of this being the desired remedy increases. For example, the first line plus the second line makes the remedy more defined. Add the third line to the other two and that makes it even more likely that this remedy is correct. The more lines of the group are added “plus” by “plus”, the more confident one can be that the remedy fits the patient.